I absolutely LOVE fresh basil and one of the favorite things I like to do with it is make fresh pesto. 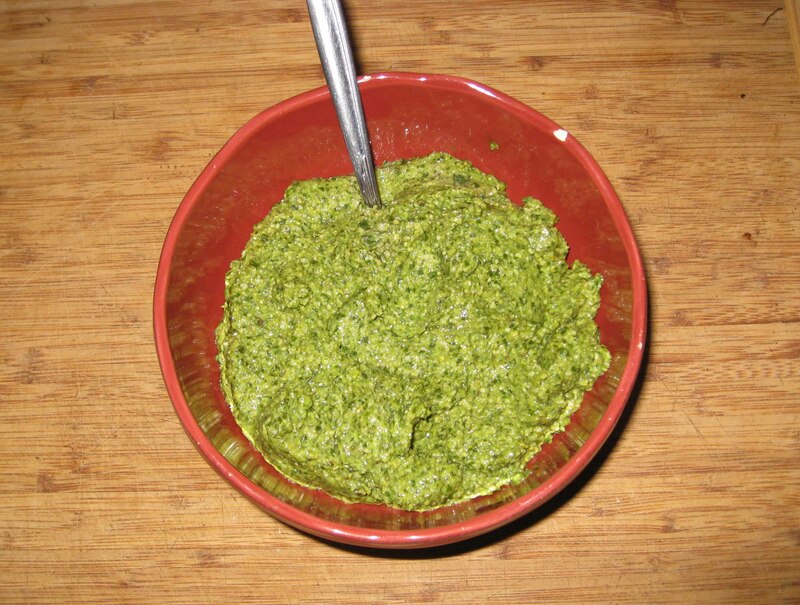 There are a lot of recipes out there for pesto. They basically combine fresh basil, nuts (usually pine nuts), garlic, olive oil, Parmesan, Romano or some similar cheese, and season with salt and pepper. My version varies by the ingredients I have on hand (or usually don’t have on hand). This is the way I made it today and no one is complaining…. 1/3 cup pine nuts (I’ve seen Walnuts and Brazil nuts substituted, but never tried them as I really like the taste of pine nuts even tho’ they are spendy). Sea Salt and freshly ground black pepper to taste (Good quality salt and pepper really brightens the taste, IMHO). 1. 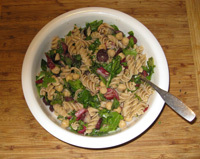 Combine the basil with the pine nuts in a food processor and pulse a few times to mix. Add garlic and pulse a few more times until evenly chopped. 2. Slowly add the olive oil in a stream while the food processor is on. Stop half ways through to scrape the sides of the bowl with a spatula. 3. Add the grated cheese and pulse again until blended. Season with salt and pepper. I really like to make a huge pot of spaghetti sauce and serve it with whole wheat thin spaghetti. I think it’s a comfort food – at least for me. I used to make the sauce from scratch (many years ago), then went to buying spaghetti, and then with some input from my son, I used a purchased spaghetti sauce that has been “doctored up.” Here’s my version. 1. Start browning ground beef, draining any excess fat. When beef is almost done, add the garlic and onions and continue cooking until onions are limp… another 5-7 minutes. 2. Add tomatoes, spaghetti sauce, basil, oregano, and crushed red peppers. Add enough water to make sauce desired consistency. I usually add about 1/2 cup. 3. Cook spaghetti another 10 minutes or so until flavors are melded. 4. Add parsley and cook a few more minutes. 5. While spaghetti sauce is cooking, boil water in large stock pot. Add a couple teaspoons of sea salt, and cook spaghetti according to package instructions. Drain. 6. Serve sauce over spaghetti and top with fresh grated Parmesan cheese. I like to serve this with stir-fried broccoli or mixed salad greens. Was invited out for an evening meal on my birthday, but both Alan and I felt we’d rather cook a meal at home instead, so had the inviters become the invitees. Hadn’t made lasagna in a long time, so decided this would be the main dish. Served with roasted asparagus and mixed salad greens with a balsamic vinaigrette to complete the meal. One of the guests brought brownies for dessert (heavenly) and another a nice red Spanish wine. 1. Brown hamburger, draining fat as needed. When almost done, add onions and garlic. Cook until onions are almost done – another 5-7 minutes. Add about a tsp of sea salt and about 1/2 tsp. black pepper. I grind my black pepper, so it’s hard to give an amount, but like putting a lot of black pepper on ground beef as it adds a nice flavor. 2. Add spaghetti sauce, diced tomatoes, basil, oregano, pepper flakes. Cook another 5-10 minutes to blend flavors. Adjust the seasonings as desired. The herb amounts are guesstimates as I just grabbed some out of the spice bag. 3. Add enough water to make the mixture a bit on the soupy side. The uncooked noodles will absorb this liquid during the baking phase. If it looks too soupy, cook it down a bit. 4. In another bowl, combine the ricotta cheese, Parmesan cheese, egg, and spinach. 5. In a 9 x 13 inch pan, put 2 cups of the tomato/beef mixture. Layer 3 noodles lengthwise, and then a 4th noodle across the top. You may have to break a part of the 4th noodle off to fit. 6. Spread the ricotta cheese mixture over the noodles, followed by 1 cup of mozzarella cheese. 7. Top with 1 1/2 cups tomato/beef tomato mixture. 8. Add 4 more lasagna noodles in same fashion as noted above and then top with the remaining tomato beef mixture. 9. Bake in a 375 degree oven until noodles are done – 45-60 minutes (the whole wheat noodles will take closer to an hour). 10. Top with remaining cup of mozzarella cheese along with some more Parmesan if desired. Put back in oven another 5 minutes to melt cheese. 11. Remove from oven and let stand 15-20 minutes before serving.